You know what creeps me out, even though I should be used to it by now? Whenever you go to a site (like Amazon) and leave that site and go to a different site (let’s say Slate) and continue to see ads for specific products that you were thinking about. It just feels weird to me, that the Internet knows and remembers the things I was thinking about buying and those things follow me (like they really don’t want me to forget I was interested in backyard sheds, which I was). Also, those targeted ads on Facebook, sometimes they’re off but sometimes they’re really on point and that can really be unsettling. Now, imagine that concept, extrapolated out to the nth degree, embodied in an avatar designed to both be your best buddy and get you to buy things. If that program functions exactly as intended, that’s creepy enough. But what if it goes wrong? That fantastic and unsettling concept is the premise behind the terrific new comic series Friendo. 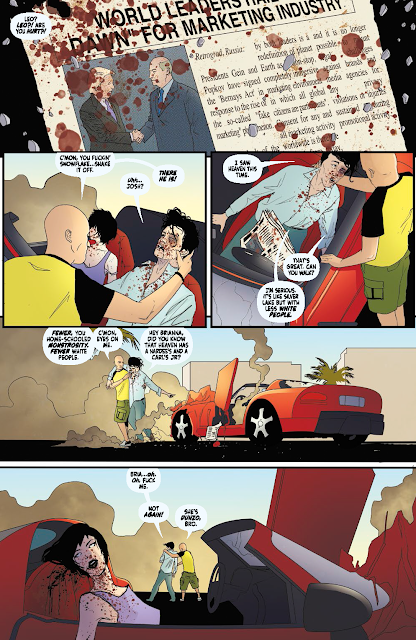 Written by Alex Paknadel (Turncoat) with art from Martin Simmonds, colors by Dee Cunniffe and letters by Taylor Esposito. I really enjoyed this debut issue, and I can honestly say that I have no idea whatsoever where it’s going next. That’s not something I experience enough in reading comics these days, and it makes me really excited to read more. The story focuses on Leo, young man who was raised by his father, a fire and brimstone preacher, to hate the physical and material pleasures of the world. We learn this from a flashback to his youth. Fast forward to the present day of the story, which appears to take place in our near future, and we learn that Leo has really gone the other way. He’s a struggling actor/club dancer/viral and guerrilla marketing participant...and things aren’t really going all that well for him. His marketing stunt doesn’t get the attention he wanted, his dancing gig doesn’t seem to be going all that great, and he is seemingly resentful of his much more successful actress girlfriend Rachael. Racahel surprises Leo with a present, the new Glaze smart glasses, which include the “Friendo” VR search engine/best buddy. The Friendo avatar is created by the glasses by asking a person just four questions (from which they can infer a scary amount about a person). Leo answers the questions and then his new buddy Jerry shows up (who weirdly reminds Leo of his college roommate). And that’s where things go terribly wrong for Leo…I don’t to say anymore about what happens in the issue, there’s some crazy stuff, you should read it for yourself. One of the things I really enjoyed about this issue is that I really don’t know where it’s going next. I like being genuinely surprised by a story and I find that doesn’t happen as often as I’d hope. But the reason that I am so interested in finding out what’s going to happen next is because of the really effective world building and storytelling that takes place in this first issue of Friendo. As you read this issue, it’s clear that Paknadel has a number of obvious strengths as a writer. first, he’s got a fantastic ear for dialogue. The characters have distinct voices and all of the dialogue, even as absurd as some of it may be, feels naturalistic. He’s just got a very good ear for what people actually sound like in conversation. Secondly, this is a comic that is just bursting with ideas and wit. As I’ve mentioned in other reviews, one of my favorite things about futuristic science-fiction stories is what they have to say about the world we’re living in right now. This story takes place in a world where people are willing to practically kill themselves in order to get publicity from a viral marketing stunt. It’s a world with gossip site drones flying around Los Angeles taking pictures or video of people with advanced facial recognition software, and where the worst thing about that scenario is that the software decides that you’re not worth recording. This may be some sort of weird near-future, but it doesn’t sound very different from the world we live in right now. In our current day world full of fake news, brands that pretend they’ve changed their name in order to just sell a product, and people that die trying to take the perfect selfie in a dangerous location...none of what’s in Friendo seems at all far-fetched. Those are the sort of clever touches that make good science fiction both memorable and unnerving. I thought the art from Simmons and Cunniffe worked very well and perfectly fit the tone of the story. Simmons has a very clean, digital style that works effectively in telling a story relating to a future where everything is marketing and virtual and digital. This is not a story that would be well-served with ethereal watercolors or scratchy pencils for art. 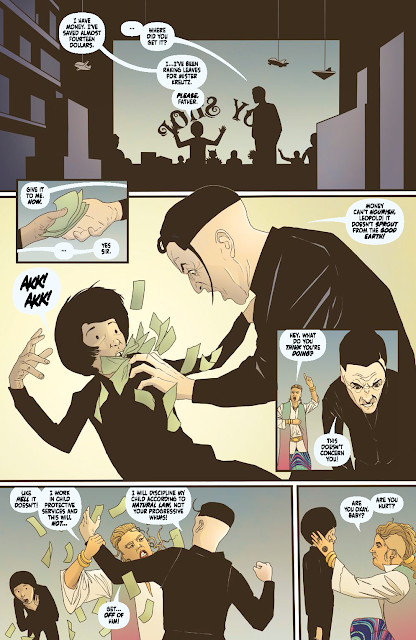 Simmons has a realistic but slightly exaggerated style that works well in keeping with the humor and satire of the story. In particular, I thought that Simmons did some very effective facial acting with the various characters in the story. Leo often looks bewildered, I believe Rachael’s exasperation, and Jerry comes across as friendly, sleazy and sinister. All of this is effectively conveyed through facial acting, and the body language and interactions among the characters. Cunniffe does some wonderful color work in this issue. Similar to the artistic style, the colors here are bright and a little exaggerated. 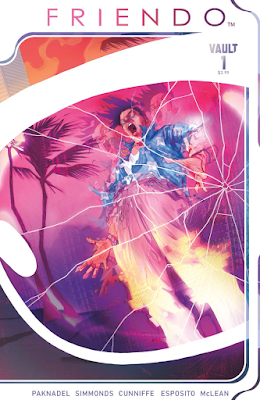 The daytime colors are vivid and Cunniffe uses various digital effects very effectively throughout the course of the issue, such as the honeycomb effect that Leo sees any time he’s looking at the world through his new VR glasses. 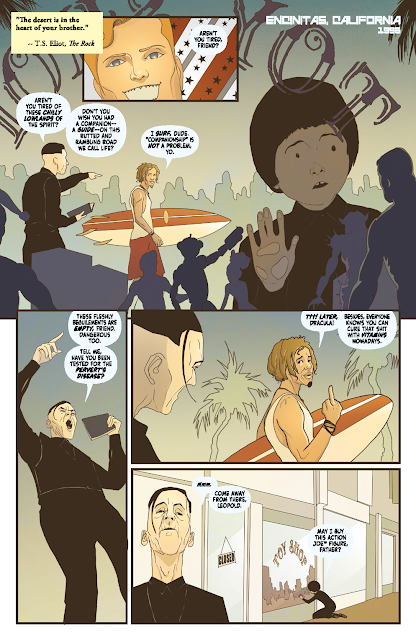 The backgrounds in the comic are often minimalist, but Cunniffe colors them in a very effective, atmospheric way. The color and visual effects work during a nightclub scene and during a sandstorm are also both quite effectively rendered, and the scattered splashes of color work perfectly with the chaotic ending of the story. I also thought that Esposito did some very skilled and effective lettering work in this issue. The font choices felt very conversational, which worked well with the tone of the story, and sound effects, screams, and other vocal effects were all nicely rendered. I really enjoyed the first issue of Friendo; this is funny, clever social satire in a frighteningly realistic near-future setting. As I mentioned before, I like being surprised by a story. I’m not sure what’s going to happen next, and I feel like the story could go in lots of different directions. That’s a great feeling, and I look forward to reading and learning more.